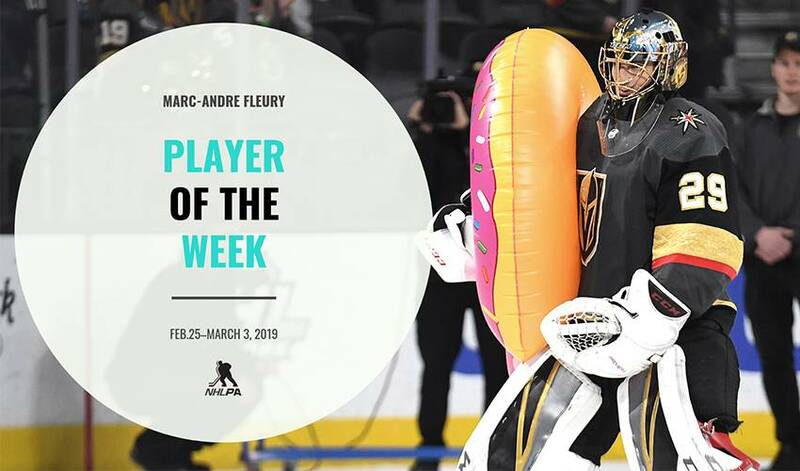 Marc-Andre Fleury ended his week by posting back-to-back shutouts as part of three wins over that span in which he surrendered just one goal to the opposition. He also led netminders with two or more starts in the major statistical categories by posting a .987 save percentage and .33 goals-against average. Fleury's eighth shutout of the season leads all NHL netminders, and was also the 56th of his accomplished career so far. As to be expected, the Golden Knights' Twitter account had some fun while doling out the love to everyone's favourite Flower. In what was his 100th game for Las Vegas, Fleury made 23 saves Tuesday to help his club end a three-game losing streak in a 4-1 win over the Dallas Stars at T-Mobile Arena. While keeping a tie game during a delayed penalty in the second period, he made it clear why his name has been bandied about for Vezina Trophy consideration. The win was his 30th of the season, marking the ninth time he's reached the mark along his NHL career so far. With a back-to-back the very next night, the Golden Knights turned to Malcolm Subban to tend the twine against the visiting Florida Panthers. Subban helped the team maintain a six-point lead for third place with 32 saves in a 6-5 shootout victory. The Golden Knights hit the road Friday for a matchup against the Anaheim Ducks. Fleury made 34 saves to post a league-leading seventh shutout in a 3-0 win. Despite the Ducks rank in the standings, Fleury was humble as he credited the club's offence for a known ability to find the scoresheet. "We know the Ducks are low in the standings, but they still play hard," Fleury said to reporters postgame. "They can get you, so it's nice to get the two points here." The shutout was the 55th of Fleury's NHL career, moving him into the 21st on the NHL's all-time list in the category. With 19 saves Sunday Fleury was at it again as he helped the Golden Knights to their fourth straight win, and his third, in a 3-0 blanking of the visiting Vancouver Canucks. It was the second straight shutout Fleury has posted this season, with the first instance occurring Nov. 23-24, 2018. After earning the game's third star and posting the longest shutout streak of his NHL career (168:43), Fleury credited his teammates for their strong play in front of him. "Last game was busier and [there were] more scoring chances," said Fleury postgame. "The guys dominated from start to finish [today] and played very well. We had the puck a lot and controlled play." After extending his hold on the league-lead in shutouts this season with his eighth, the Golden Knights are off until Wednesday's matchup at home against the Calgary Flames before the team embarks on a three-game road trip.